Every parent’s worst nightmare! Except one of the parents is the lead reporter on the case. LOVED this story!! And the multiple narrators were fantastic. Don’t miss this one. Two girls travel to Thailand for their Gap Year but suddenly go missing. Their frantic parents in England get no real help from the authorities in Thailand so they turn to the press for assistance. It turns out that Alex, the more sensible of the pair, didn’t really know her traveling companion Rosie all that well and their trip to Thailand ends up taking all the wrong turns. Their families turn to Kate Waters, a reporter who is eager to tell their story. But Kate is actually harboring her own painful secret: her son Jake dropped out of university several years before and basically disappeared in Thailand. Her smart, sweet and nerdy son has not been in touch with his family and Kate and her husband fear for his safety. Kate soon becomes enmeshed in the lives of the missing girls’ families and becomes the center of even more drama: she is taken off the story due to her own son’s possible involvement in Alex and Rosie’s disappearance. 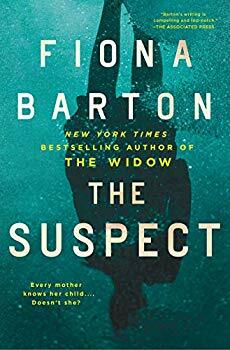 ‘The Suspect’ is an intensely compelling story with many twist and turns which end in a stunning conclusion. Each family’s story is told from alternating points of view that are at once gripping, thrilling and compelling. Does any parent ever really know their own children? The mystery of what happened to Alex and Rosie slowly unfolds in a completely surprising and terrifying way. As a parent, I was on the edge of my seat waiting for the next chapter. As a reader, I could not wait until Kate and British investigator Bob Sparks got to the bottom of the girls’ disappearance. The exotic locales are described in all their colorful glory but the author doesn’t hesitate write about the dark side of Thailand. Gap year travel may be exciting but the dangers of travel abroad are laid out in painful detail here. The author also explores the sometimes tragic role of social media in our lives. This book starts off rather gently and then the last part of the story virtually rockets to a shocking conclusion. Although this is the third book featuring Kate Waters, it absolutely can be read as a standalone. I highly recommend the audiobook, however, with the multiple narrators perfectly voicing the different points of view. Although I received an advanced review copy of this book, I downloaded the audiobook and absolutely loved it. Thrilling and addictive, ‘The Suspect’ will stay with me for a long time. Another wonderful suspense story from Fiona Barton! Have to read this one!